Ultimate luxury and French style sophistication! Fine percale sheeting accented with an applied sateen overlapping framework border. Shams have an optional flange treatment in the same color, or as a contrast color to match the border. 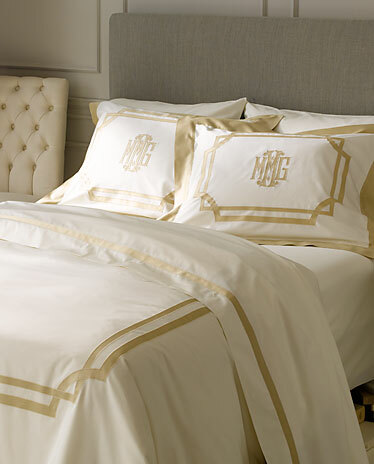 Brigette appliqué monogram shown. Available as a coverlet on Diamond Pique. Please Call for Assistance. Custom Product- Imported -Delivery approximately 7-8 weeks.